Phoenix Park Inn Resort, the inimitable resort in the heart of the immensely happening district of North Goa, truly complements the spirit of Goa. 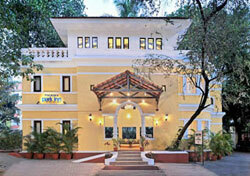 The resort is located an easy buggy ride from Goa’s famed sea n’ sand. For those who long for the sand between their toes, an hourly shuttle whisks guest away to nearby Baga Beach (1.5 kms). Please use the links on the left for further information on Sun Village. Room Facilities: Well-appointed rooms in a melange of vibrant decor & striking colours, spread around a central swimming pool. All rooms have ACs, tea/coffee makers, minibars, colour TVs with remote, telephones with STD/ISD facilities, & bathrooms with showers (no bathtubs). There is no room service facility; however, a limited snacks menu is served in the rooms thru Geoffrey's. None of the buildings have elevators.